The journal of my life with family and food. You are currently browsing the tag archive for the ‘peaches’ tag. Today is BEAUTIFUL!! The sun is shining, the temps are in the 50-60’s, the sky is blue! I love it. I wish I didn’t have to work, the is gorgeous weather. So at the store yesterday I picked up a few new items. I only took my oldest because we are having satellite troubles and B had to stay home for somebody to come by and take a look at it. sadly though it looks like we’ll have no TV for a week. I am silently rejoicing…Whoo-Hoo!…but I think my family will slowly implode over the lack of HD branial stimulation. There have been plenty of discussions already as to what DVD will be played and when. We only have one DVD player in the house so Daddy and 2 small children will have to learn to share. 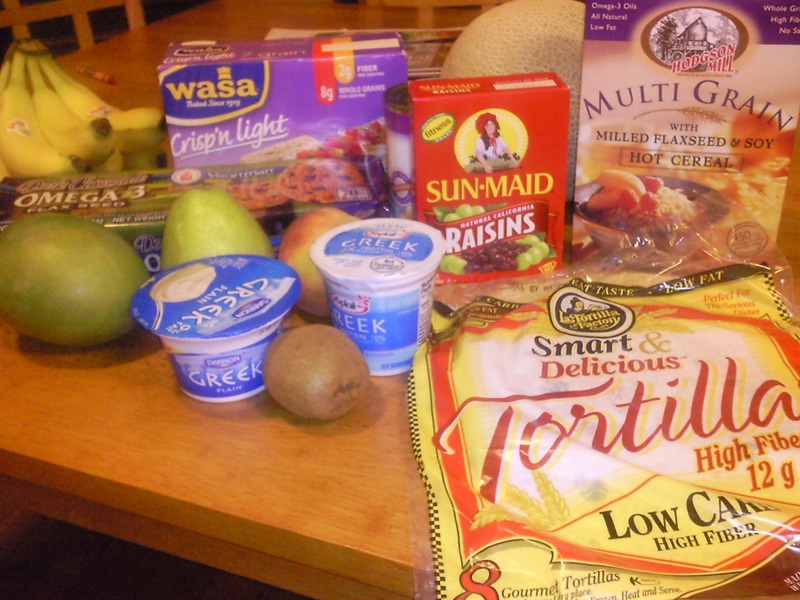 I love that I found the La Tortilla Factory Low Carb Tortillas. I have been searching for them everywhere, and I finally found them! Only 80 calories and 12 g fiber for this huge sucker! 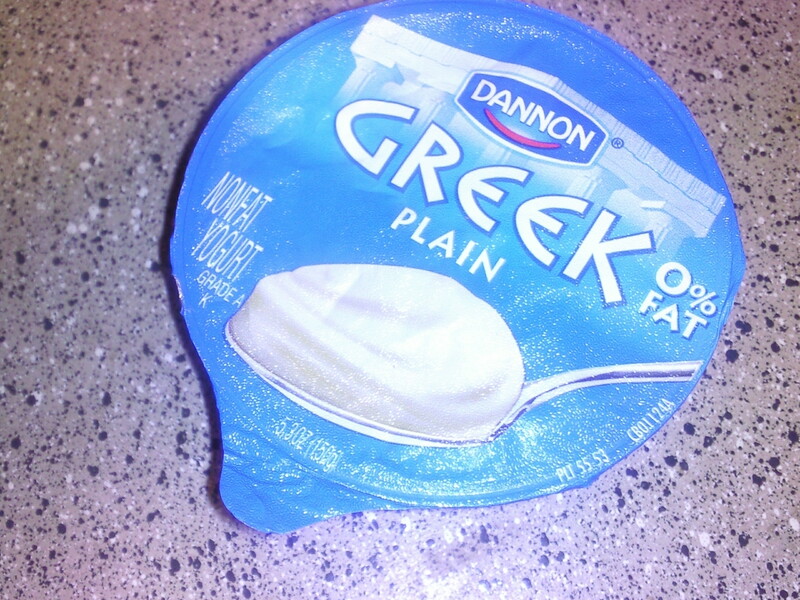 I was also excited to try the Dannon Greek yogurt. I actually thought I was buying all Dannon, but when I got home I realized I had purchased both the Dannon Greek and the Yoplait Greek. That’s what happens when your 5 year old comes down with the case of the gimmies when the store decides to put baked goods right next to the milk/dairy section. Both yogurts are about the same but the Yoplait has fruit and is slightly higher in sugar than the Dannon. Oh well, they are a good deal at only $1.19 per container so I am more than willing to try both. We got home super late for our household anyway. Way past our normal dinner time and we were starved! 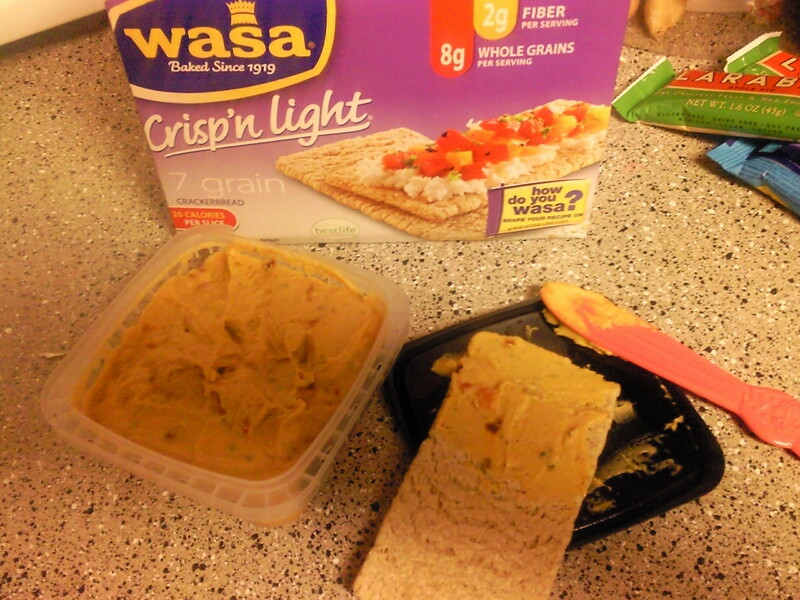 While B made dinner I munched on some Wasa crackers and Triple Pepper humus. I could have eaten this all night, but I would have ruined my appetite! Dinner was the jambalaya dish he made last weekend. 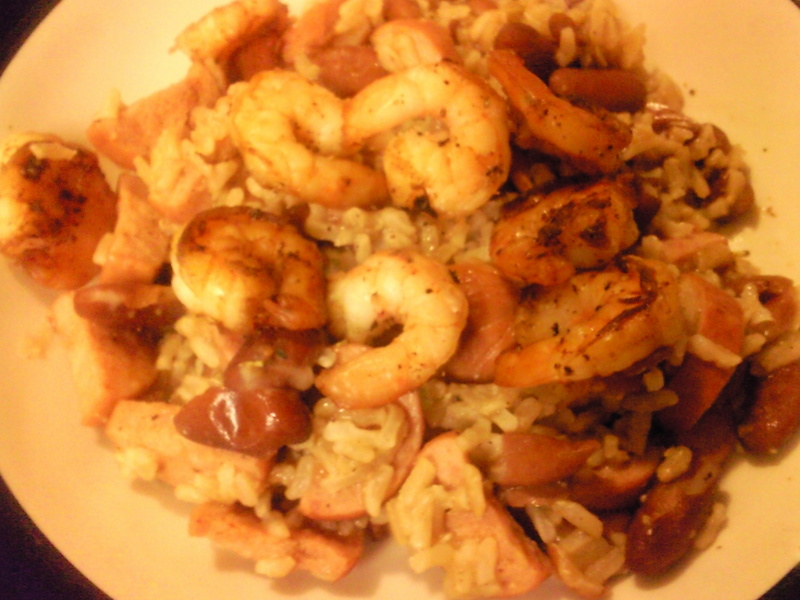 It contained Healthy Ones Smoked Turkey Sausage, kidney beans, brown rice, and a little bit of shrimp for me. Excellent flavor and of course Franks Red Hot didn’t hurt. By the time we finished eating, it was a little after 9, so I wasn’t super hungry for anything sweet. 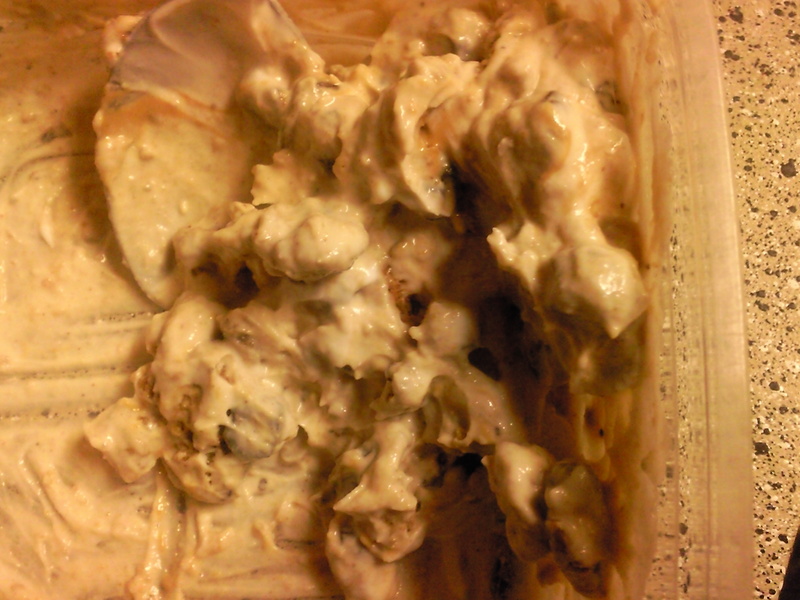 I did want to try some of the Dannon plain Greek that I had just bought so I crumbled up a Voortman Dark Chocolate Omega 3 Flax Seed cookie, a little bit of Better N Peanut Butter, and a couple of raisins were thrown in too. OMG what a yummy yogurt mess! 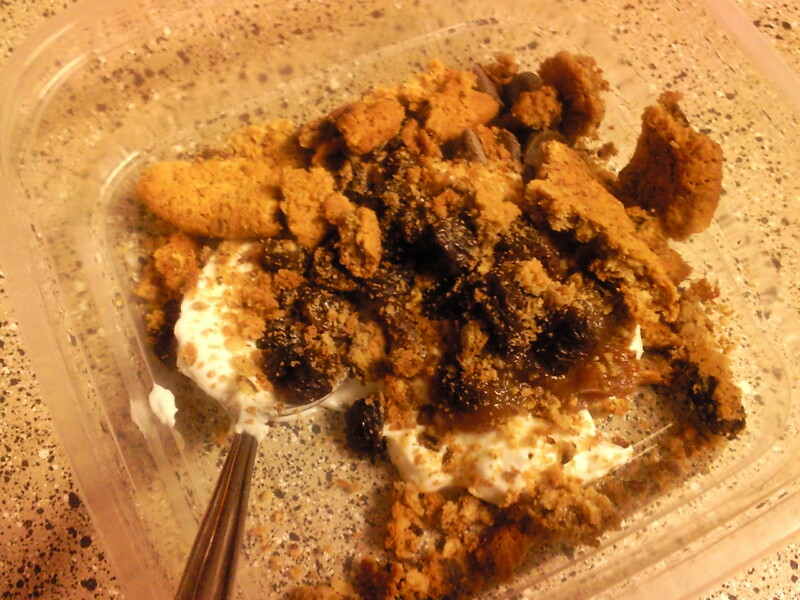 It wasn’t too terribly filling, just the right amount of sweetness so it was the perfect ending to a busy day! Today’s breakfast was of course the weekly Sunday donut fix from Peepaw. The girls were beside themselves anticipating their sugar rush. I ate another egg and sausage biscuit. I can’t deny that they are good though! Lunch for me was early as I had to get to work, so I fashioned a turkey wrap with one of the La Tortilla tortillas, spread some Garlic and Herb Laughing Cow cheese on, and added some deli sliced turkey breast. I included my veggies. 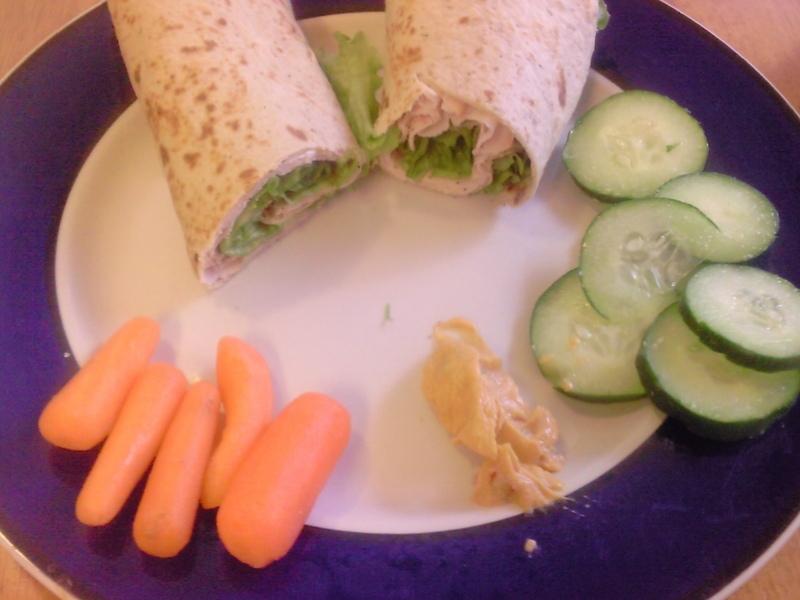 a side of baby carrots and cucumber with a dab of triple pepper humus. 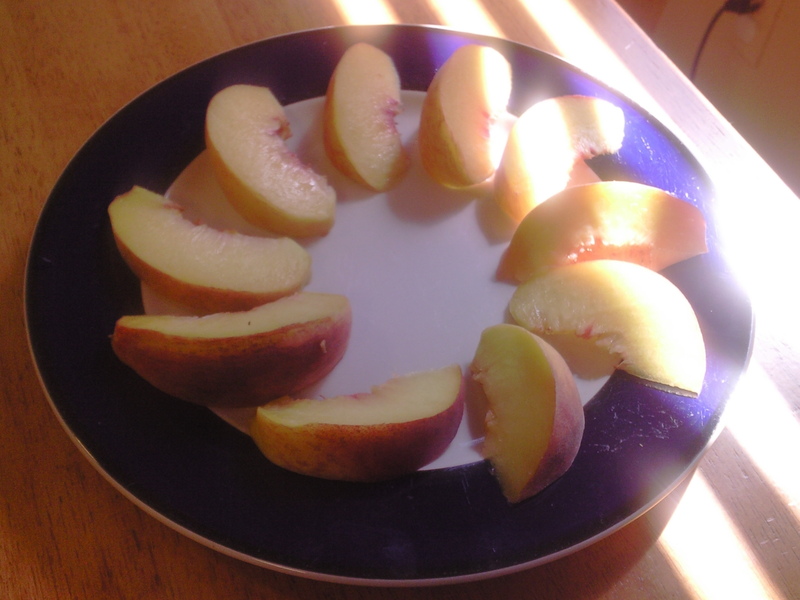 My pretty peaches were reflective of how I felt about the weather…Sunshine-y! I had a helper though. 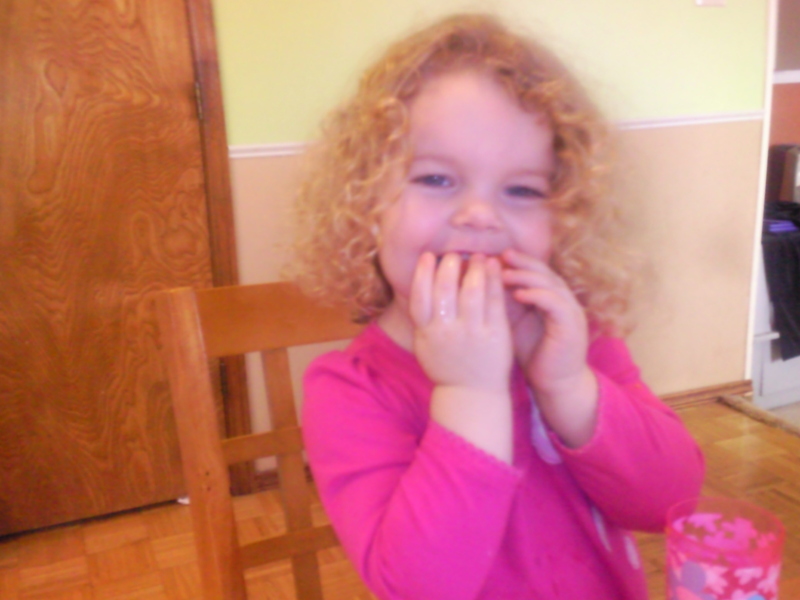 Baby girl was grabbing at the carrots, cucumbers – calling them pickles- and of course we ate the peaches together. Who could deny this face! That’s all for now folks! Off to work the day away.